Is our climate changing and is humanity causing it? The answer to both is a definite yes. The IPCC, International Panel on Climate Change has agreed that climate change is occurring and that humanity is causing it. The IPCC was setup by World Meteorological Organization and by the United Nations Environment Programme. The panel consists of many scientists from all over the world. The reports are then approved by representatives of all member countries. These reports are very scientifically determined but with many governments involved it is on the conservative side. (source) I am planning a series of articles based on the IPCC report and up first is describing their story-lines. As a basis for their scientific inquiry they developed four general story-lines for the Earth over the next hundred years. There are also some alternative story-lines related to the four major ones. These control the variables that they use in there climate models. Below is a graphic that shows the the four main story-lines and the influences that define them. These story-lines are routinly referenced in all of the IPCC reports. 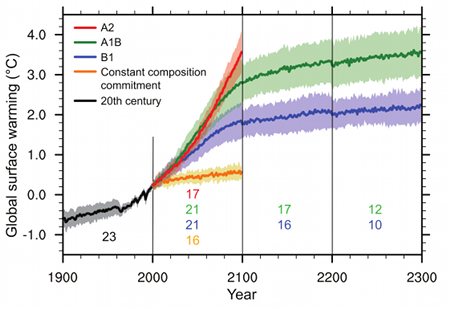 Below is one of the IPCC graphs showing the global warming trends based on the story-lines. 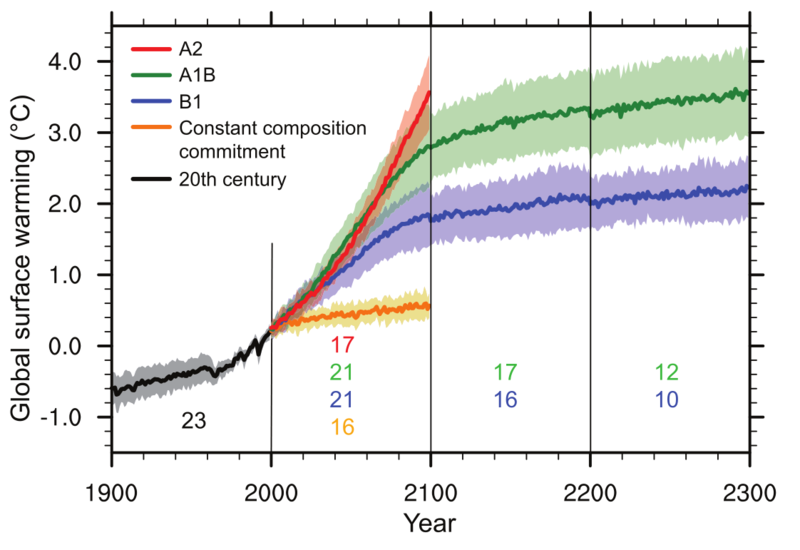 This shows the average global temperature rise, the actual change in a particular area will differ. In the next article we will take a look at some of the temperature changes and the consequences of those changes. These story-lines are only possible paths for humanity. They are not making predictions on which one we are on. They also do not have a preferred path.